Congratulations! You’ve landed an internship and are eager and excited to begin developing as a professional. I tip my hat to you my friend and know that you are going to have a great experience. But before you hit the office, here are some etiquette tips to keep in mind to ensure you make the best impression possible. Be prompt. You must, I repeat MUST, be on time. This means at least 15 minutes early to the office and any meetings and appointments throughout the day. If you are commuting make sure you do a trial run or two before your first day to ensure you have the route down and will not be that girl who can’t get anywhere on time. Remember: If you are early you’re on time, if you are on time you’re late, and if you are late don’t even bother coming. Be modest. This applies not only to what you wear but to your behavior as well. Depending on the industry your wardrobe restrictions will vary, but always err on the side of caution; the less skin the better. When it comes to behavior make sure that anything you say or do you would be comfortable having everyone in the office know. Be willing to admit you are wrong and learn. Clearly you are a talented collegiate with a lot to offer. After all, a great company hired you and you were chosen out of a huge pool of applicants. However, you have a ton to learn and you will make mistakes. Remember it is best to admit when you’ve slipped up and ask for help instead of trying to do everything yourself. Your boss and coworkers will have more respect for you when they see that you know what you don’t know. Be prepared. Before your first day learn all you can about the company you’re working for, the culture of the office, the objectives of management... anything and everything will be valuable to you. Get all of your assignments done well in advance, prepare for meetings with your boss, and remember that prior planning prevents poor performance. 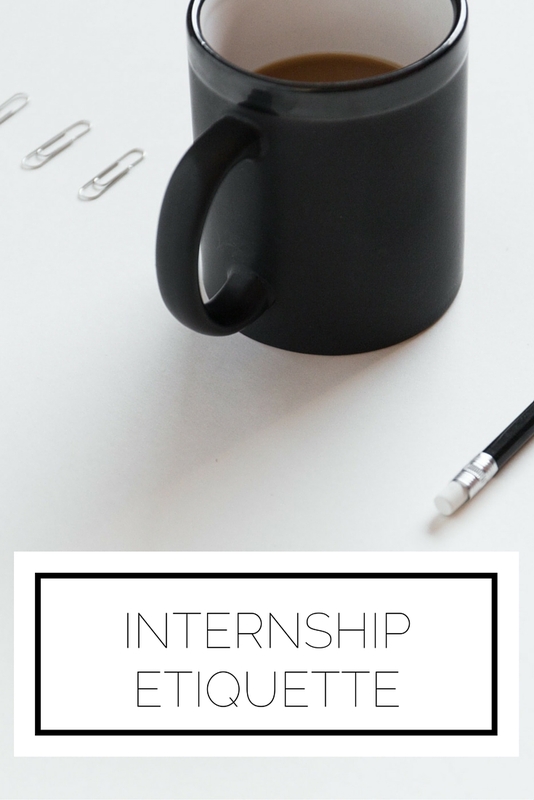 If you follow these tips you’re sure to have a great internship experience and leave the office raving about you. Best of luck! Do you have any internship etiquette recommendations? Any experiences to share?